WW1 Reenactments Equipment : Great War Tommy WW1 Reenactors Equipment : Flannelette Patches Wrapper. WW1 Reproductions and WW1 Reenactors Equipment / Kit - Flannelette Patches Wrapper. 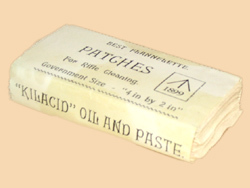 Paper wrapper for "Kilacid" brand Best Flannelette Patches, for rifle cleaning. "Government Size - 4" by 2" ". Mk III Flannelette (4 X 2) was officially introduced in 1904.